It's been creepy to see economists and the financial media cheering the re-levering by American households as a sign that they economy is on the mend and consumers are regaining their will to shop. 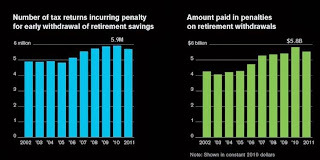 But ordinary Americans took huge balance sheet hits in the crisis: the loss of home equity, which only in some markets has come all the way back; job losses and pay and hours reductions, which led many to run down savings as they readjusted; declines in stock market portfolios; lower income thanks to ZIRP for retirees and other income-oriented investors. While the top wealthy are borrowing, in contrast to the behavior of the rich predecessors, on the other end of the spectrum, many are still struggling for survival. The latest job report showed that the number of long-term unemployed, reflected in the level of people who've given up looking for work and are counted as no longer in the workforce, only continues to rise. Food stamps and extended unemployment benefits have been cut. And with soup kitchens under stress too, one wonders how people who are in such dire financial straits manage to get by. Before the crisis, if someone was hit with a financial emergency, like an accident or sudden job loss, those who had houses could often draw on home equity. With that piggybank depleted or non-existent, the last-ditch financial fallback is accessing retirement savings. Now admittedly, this does not necessarily take the form of partial or full liquidation of a 401 (k). Some plans allow for borrowing against 401 (k) assets, but it's no free lunch. Borrowing is limited to a maximum of half of plan assets or $50,000, whichever is lower. While the borrowing is interest free, the funds need to be repaid in five years. If someone is already under economic stress, what do you think the odds are that he will be able to repay the loan, particularly since it comes out of after-tax dollars? And the alternative is even more costly. 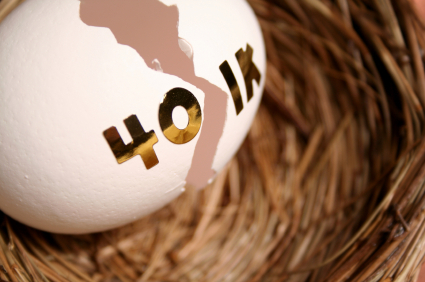 Withdrawing money from a 401 (k) before age 59 1/2 incurs a 10% penalty. On top of that, the taxpayer also has to pay income taxes on the withdrawal. 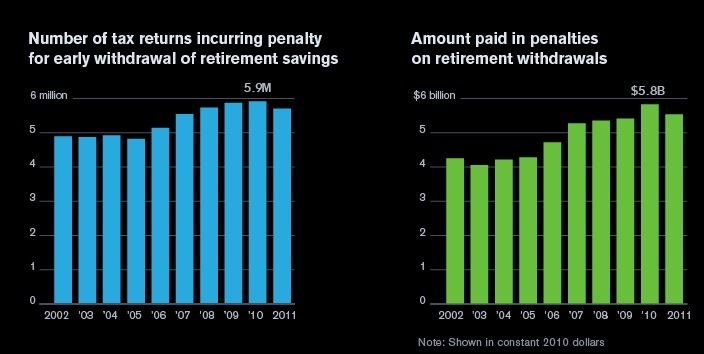 A Bloomberg story gives the sobering details of how prevalent 401 (k) withdrawals have become. For the latest year in which data is available, 2011, 4% of all households paid early withdrawal penalties. 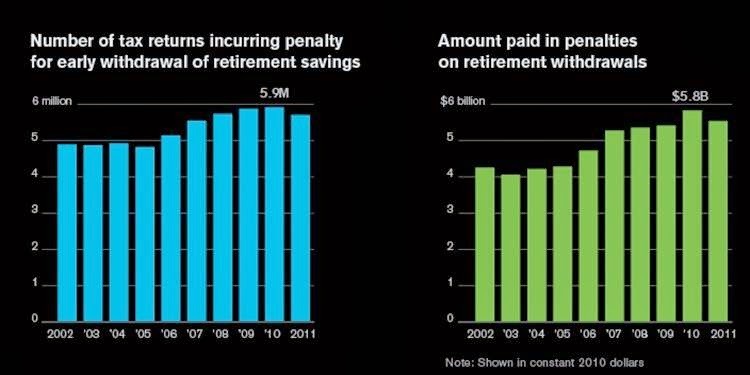 A Federal Reserve study found that 9.3% of taxpayers with retirement accounts paid early withdrawal penalties, an increase from 7.9% in 2004. The article points out that one-third cashed out their 401 (k)s when they changed jobs, which they argue shows that many workers, particularly the young, don't appreciate the true cost of early withdrawal. But I suspect the picture is more complicated. One of the few ways you can escape early withdrawal penalties is a first-time home purchase; at least a portion of the younger individuals may be buying a home. Conversely, others may need to pull money out simply to finance a move. Adjusted for inflation, the government collects 37 percent more money from early-withdrawal penalties than it did in 2003. Meanwhile, the amount of home-equity loans outstanding was $704 billion in 2013, down 38 percent from the 2007 peak, according to Federal Reserve data. "They didn't have access to the home equity that they had in the past," [Reid] Cramer [of the New America Foundation] said. "And families looked around for what was left and they actually drained the value from the 401(k)." The article discusses the divergent policy views: make it easier for people to access their retirement accounts, recognizing that they may be under duress, or make it harder to force them to keep their savings intact. Of course, you don't hear any mention of the notion that what is really needed is a stronger job market, with better paid work, so more people can build up a saving buffer. So, last year, at age 56, she moved about 90 miles from her home in Edinboro, Pennsylvania, into her mother's basement. To make ends meet as she moved and then quit the job, Cromie pulled out $2,767 from her retirement savings. Still unemployed, Cromie is trying to avoid tapping what's left of her retirement savings — $7,000. This reads like a Dickens novel. Her retirement savings, in her mid 50′s, were less than $10K but she tapped 1/4th of that. She had to pay a 10% tax penalty plus the funds were treated as ordinary income. In contrast, the executive who outsourced her job probably has investments that will be treated as long-term capital gains and taxed at a much lower rate and the people managing her paltry retirement fund are probably taxed at carried interest rates too. Welcome to the world of markets uber alles.